I found Dawn Patrol Games as they were quite active sharing their game assets on Sketchfab. I got in touch end ended up in Sri Lanka! We are Dawn Patrol Games. We’re a fully-funded independent game development studio based in sunny Sri Lanka. We are currently developing for iOS and Android, but we also keep a close eye on the future for new and wonderful ways to have fun making – and playing – games. Our management team is made up of industry veterans from the console, mobile and online games spaces. Our collective background with connected platforms gives us a great opportunity to channel our creative passion and experience into original ideas and experiences we think you’ll love. Unity is our platform of choice. The tech’s the industry standard behind some of the best (and best-selling) games in recent years; its cross-platform capabilities will enable us to share our work across a wide range of devices. We make games, and we hope you’ll play them. Anytime. Anywhere. Being a small indie studio we do everything in-house. From concept to design to in-game asset we do it all. The really big aspects would be model design, texturing, rigging and animation. Actually, a childhood friend who had been working in the games industry for a long time had the idea to come back home and start a game development studio. Growing up as lifelong gamers, I think we all had had enough of working in the corporate sphere and not to sound cliche but we just wanted to do our own thing, and gaming was the common denominator. In a nutshell, we raised the capital, left our jobs, moved back to Sri Lanka, and here we are 3 years on. Game development like any other job is a learning process, but we feel that in the past 3 years we have not only grown as individuals but also got stronger as a team. Our process is not very complicated, we come up with design concepts, shortlist the ones that we like and then move on to building the actual model. Almost all of our models have had quite a few moving parts so they have to be built in a way which makes them easy to rig in order to give them the animations we want. At this point we test them in the game to make sure that they are functioning as per their animation sets. While all this is happening, the models are being detailed and textured as well according to their final looks. With any creative process there is always some amount of iteration, but we try to keep most of that for the concepting phase. We just wrapped our 3rd project/game called Nitropia – Tower Defense/Real Time Strategy mashup. The game will be launching at the end of October. Currently we are working on the android version which we will hopefully release soon after the iOS version. 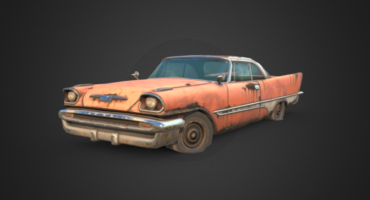 What is your favorite model you currently have posted on Sketchfab? That’s a tough one since they are all so cool and unique. If we had to pick one then it would be Hornfurr. The character is based on the anatomical structure of a Gorilla. Even though his poses and actions are limited based on it’s structure, the model has a good line of action and flow any way we pose it. Also it has a very distinctive silhouette which stands out. Overall, the character design has good arcs, curves, balance and movement throughout. What are your thoughts on 3D printing, do you plan to work with it? Like all new technologies, 3D printing has come a long way and is still maturing and will have bumps along the way, but is more accessible to the mainstream consumer than ever before. As a game development studio we would love to be able to bring all our unique models to life and we are excited about working with in the future. Actually, we had posted a few models on our twitter feed and someone mentioned that they would love to see these on sketchfab. Honestly, we had not heard of Sketchfab till then. Sketchfab has helped us showcase our work and really bring our models to life. With the your viewer we have been able to embed models on our blog and facebook and present them to a much larger audience. Inspiration is all around us. From nature to pop culture and beyond. We are always trying to come up with new and unique ideas for our games based on things around us and our daily lives. We have a few cool game concepts in our vault which I can’t disclose at the moment, but suffice to say they are inspired by some very simple things. Experience and working in that field obviously helps, but more than anything you have to be passionate about what you do and never settle. I think in this case it’s as simple as practice makes perfect.